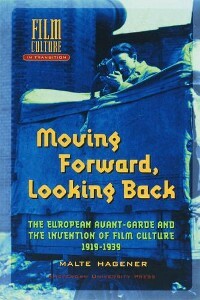 Malte Hagener’s Moving Forward, Looking Back: The European Avant-garde and the Invention of Film Culture, 1919-1939 offers a remarkably multifaceted and compelling historical study of the European cinematic avant-garde of the 1920s and 1930s and its considerable legacy in film culture as a whole. While a wealth of scholarship has traditionally engaged the film avant-garde in an object-centered and predominantly formalist manner as a set of stylistic movements, corpus of films, and groups of filmmakers, Hagener’s work joins an ever more substantial body of scholarly literature that treats avant-garde formations within their social, cultural, and institutional contexts. A materialist, archaeological approach of this kind has born many fruits over the past three decades in the historiography of such areas as early cinema and the classical Hollywood studio era, but the study of avant-garde film has, on the whole, been slower to pursue this path. Hagener sets out to rethink the way the avant-garde conceived itself and to analyse the tensions that animated its internal debates during the 1920s and 1930s. By developing a more expansive frame of reference for studying the film avant-garde, he is able to revise the standard story often told about how the transition to sound in European cinema around 1930 led to the collapse of the avant-garde just when it had reached its peak, as experimentation succumbed to new forms of standardisation. In fact, as Hagener shows, this tale of rupture is too simplistic and obscures the wide-ranging influence that avant-garde film cultural practices and institutions have exerted on a host of subsequent developments in film culture. For Hagener, the film avant-garde must be understood as a phenomenon broader than a cluster of texts and techniques. In the interwar period, the avant-garde had a transnational scope within Europe as well as extending into the Soviet Union. Hagener sets himself the task of tracking it as a network defined, in particular, by the key cities of Paris, Berlin, Amsterdam, London, and Moscow. Furthermore, Hagener notes, because the avant-garde’s utopian program called for a fundamental transformation in culture and society that would break down the barriers between art and life, it remains insufficient to look back at only the artistic side of the movement. Instead, Moving Forward, Looking Back casts its attention on the whole gamut of the avant-garde’s social practices and cultural discourses set within their material conditions. Hagener’s book investigates the avant-garde through its strategies of self-promotion and relations with the mainstream film industry, its efforts at establishing an alternative circuit of organisations and support structures for production, distribution, and exhibition, its screening contexts and programming policies, and its discursive activities in publishing, teaching, and lecturing. In all these activities, the avant-garde tried to mount a “Medienverbund (media offensive)” designed to create a new audience and “a new art for new statements in a new public sphere” (p. 33). In order to produce a rich account of the avant-garde’s internal contradictions in the mid to late 1920s, Hagener turns to the period’s contemporary debates in the press and in specialised magazines over the status of the avant-garde. One of the chief values of his work is that it synthesises a great deal of past scholarly research (most of which was constrained to a single national cinema or artist) and re-analyses a wealth of German, French, Dutch, and Russian historical source material unavailable in English. Many have addressed the perennially contested definition of the “avant-garde” and the term’s continued viability in the present. Hagener intrepidly revisits this terrain, drawing on the theoretical writings of Walter Benjamin and the scholars Peter Bürger and Andreas Huyssen. Most crucially, he adapts the systems theory of Niklas Luhmann, which allows him to recast the idea of a static antagonism between the avant-garde and industry as a more nuanced, dialectical interaction of dynamic, mutually dependent systems. The avant-garde was never as cut off from the industry as its most ardent polemicists liked to proclaim, and Hagener extensively discusses the importance of financing that was obtained by many avant-garde filmmakers through industrial commissions, state subsidy, and private patronage. Instead of affirming the avant-garde’s proclivities toward idealised and static distinctions between independence and dependence, he sets out to bring a close eye to bear on the dynamic ways these strategic distinctions were argued for and established. In conjunction with the issue of independence and dependence involving sources of funding, Hagener delineates three other fault lines inside the avant-garde that led to major problems by the end of the 1920s. Increasingly deep rifts opened in the avant-garde in a variety of areas. In the realm of aesthetics, proponents of abstraction and cinéma pur or absoluter Film sided against defenders of a documentary realism, while the expressionist and constructivist wings of the avant-garde had wholly different conceptions of artistic practice. In the realm of cultural address, charges of elitism and populism were hurled as some avant-garde circles sought small like-minded communities and aimed to elevate film into the art-world institutions of high culture, while other avant-garde groups proposed to reach and transform a mass audience. Lastly, in the realm of politics, alliances were sundered as divisions emerged between the anti-fascist left, split between reformists and revolutionaries, and various anarchist and fascist participants in the avant-garde. In Hagener’s telling, these problems seemed to be debilitating impasses by the late 1920s, but in fact they demanded new kinds of resolutions and served as flash points for productive redirections of critical energy. The avant-garde brought such aesthetic and political questions to the fore in their disputes and shifting alliances. But as an unstable dynamic formation, it never directly resolved these points of contention. In Hagener’s historical and theoretical analysis, the avant-garde had at its heart one further problematic that in the end made it “bound to fail” on its own terms (p. 37). In the book’s chapter on the interactions that occurred between the Soviet Union and Europe in the 1920s and 1930s, Hagener demonstrates how this problematic worked itself out to the most acute degree in the history of the Soviet avant-garde’s downfall and the ascent of Socialist Realism. The book’s title refers to what Hagener calls a “paradoxical temporal construction,” which derives from the spatial concept of a military avant-garde being employed in a temporal sense (p. 37). The avant-garde conceived itself as already moving forward immediately toward a utopian future, all while looking backward in negative opposition to past traditions and institutions. The resulting “temporal double bind” pushed the complicated situation of the present out of view (p. 38). As Hagener concludes, this “dialectic tension…generated energy, yet also proved disastrous” (p. 38). The avant-garde’s utopian aspirations never proved to be achievable, and within its historical conditions, it only succeeded in stimulating gradual productive transformations. The avant-garde thus inherently worked in a tragic movement of cyclical self-destruction. In this ambitious analysis, Hagener reignites some of the most contentious issues surrounding the politics of utopia, political vision and strategy, and the relation between artistic and political activity. Based on this conception of the avant-garde’s predicament, Hagener re-examines a moment of technological “crisis” in film history – the introduction of sound into European cinema in the period 1928-1931 – and argues that it indeed marked a moment of decisive transition for the avant-garde, exemplified by the pivotal international summits that the avant-garde held in La Sarraz in 1929 and Brussels in 1930. But the coming of sound did not spur the demise of the avant-garde due to aesthetic or formal reasons. Rather, according to Hagener, the arrival of sound was a key technological factor and catalyst in the context of other social, cultural, and industrial transformations, which can only be sufficiently grasped by seeing the networked aspect of the movement. As a result of the economic restructuring and standardisation of film industries throughout Europe, along with the 1929 global economic downturn, new stresses were placed on the avant-garde’s various networks of production, exhibition, and distribution. Hagener argues that the “defeat” of the avant-garde at this moment – when it failed to achieve further integration as a concerted movement for sweeping revolutionary change – can now be seen as a “triumph” with ramifications for many different institutionalised contexts (p. 36). In Hagener’s terms, the historical conditions of the 1920s allowed the “strategic convergence” of various avant-garde constituencies (from aesthetes to radical political activists, a formation of diverse, conflicting impulses mobilised against a common enemy) to reach a “critical mass” (p. 36). What followed was the “functional differentiation” of the avant-garde on many distinctive fronts – a “migration” in the distribution of “avant-garde energy” (p. 36). Hagener argues that the avant-garde’s relatively small network of practitioners, activists, and organisers played a significant and sometimes leading role in a variety of developing institutions and discourses that became integral to later film culture and even the early disciplinary history of film studies and film pedagogy. The book connects the avant-garde to the rise of film societies in the 1920s and 1930s, which eventually fed into the emergence of art house and repertory cinemas and the broader cultural acceptance of film as an art form; the foundation of the first film archives around Europe (in Great Britain, France, Sweden, Germany, and the Soviet Union) and the enactment of large-scale state support for film in the 1930s; the rise of film-related pedagogical practices, such as lectures at screenings and vocational training in film schools; the proliferation, circulation, and translation of book and magazine publications comprising the first significant wave of writings on film history, theory, and criticism; and the beginnings of an “event culture” of conferences and film festivals. Throughout the book, Hagener aims to provide a comparative perspective, weaving together many threads of biographical and institutional history across the European network. Hagener highlights the crisscrossing “ant-like paths” of such figures as Hans Richter, Joris Ivens, Sergei Eisenstein, Léon Moussinac, Ivor Montagu, Germaine Dulac, Iris Barry, Henri Langlois, Charles Chaplin, Dziga Vertov, and Henri Storck, each of whom acted in many varied capacities, as a means to develop a larger historical account with explanatory power “on a structural level” (p. 187). In the final chapter, Hagener undertakes his first sustained textual analysis, turning to two films from 1929, John Grierson’s Drifters and Walter Ruttmann’s Melody of the World. Here, building on Bill Nichols’ account of the documentary and modernist avant-garde (1), Hagener’s reframing of the avant-garde sheds light on each film in its relation not only to the avant-garde’s institutional contexts and to the coming of synchronised sound, but also to the emergence of the documentary as a distinctive film form. While the book could have been more cohesively organised in drawing its many intersecting strands together, it should still be of great interest to scholars of European cinema and avant-garde film. It signals new directions for further studies of the European interwar period, and it also opens new paths for cultural, social, and institutional histories of film that extend into the postwar era, both inside and outside Europe, which seek to treat the development of a specialised film culture devoted to cinema as an art form. Hagener’s work could be complemented by being read with a number of recent cultural histories that have prominently dealt with such issues in relation to specific archives, organisations, and publications. For example, one might consider Laurent Mannoni’s Histoire de la Cinémathèque française, Haidee Wasson’s Museum Movies: The Museum of Modern Art and the Birth of Art Cinema, and, on the subject of the North American avant-garde, scholarship by Scott MacDonald (such as Cinema 16 and Canyon Cinema), David James, Jan-Christopher Horak, Paul Arthur, and Michael Zryd (2). Furthermore, the approaches embodied in studies, such as Sally Banes’ Greenwich Village 1963 (3), that set out to account for the workings of specific art and cultural scene at a particular historical moment could also prove immensely useful to similar social and institutional-oriented projects. At first, Moving Forward, Looking Back’s substitution of defeat for victory in telling the story of the avant-garde risks discounting the movement’s most committed political imperatives. Hagener goes so far as to suggest his approach could be “loosely called ‘post-ideological.’” (p. 16) This notion might rather indicate a scholarly viewpoint that is equally and inescapably ideological, yet simply neither shares nor assumes a stake in the utopian oppositional stance of the historical avant-garde, as did earlier more purposefully affirmative and canonising histories. Hagener’s contribution raises the question of how to take a measured view above the fray and consider a movement that was so polemical and passionate. Hagener bolsters his work’s fresh shift in perspective with an assiduous analysis of the avant-garde’s debates over radical politics – more scrupulous than those found in traditional accounts of the film avant-garde. This framework ultimately provides the reader with a more coherent and complex historical explanation of the classical avant-garde’s transformation and its place in wider film history and historiography. For a different perspective, it is striking to open another recent volume on the avant-garde film tradition, Nicole Brenez’s expansively framed and wide-ranging primer Cinémas d’avant-garde, and find Jean- Marie Straub’s pronouncement from 1970: ”The cinema will begin when the industry disappears.” (4) As a counterpoint, Hagener’s work is perfectly in line with the position that a more distanced and clear-eyed understanding of the avant-garde’s past fortunes is needed for marginal, oppositional, and alternative practices to develop ways to make specific and consequential political interventions in the future. Moving Forward, Looking Back: The European Avant-garde and the Invention of Film Culture, 1919-1939, by Malte Hagener, Amsterdam University Press, Amsterdam, 2007. Bill Nichols, “Documentary and the Modernist Avant-Garde”, Critical Inquiry, vol. 27, no. 4, Summer, 2001, pp. 580-610. Laurent Mannoni, Histoire de la Cinémathèque française, Gallimard, Paris, 2006; Haidee Wasson, Museum Movies: The Museum of Modern Art and the Birth of Art Cinema, University of California Press, Berkeley, 2005; Scott MacDonald, Cinema 16: Documents Toward a History of the Film Society, Temple University Press, Philadelphia, 2002; Macdonald, Canyon Cinema: The Life and Times of an Independent Film Distributor, University of California Press, Berkeley, 2007; David James, The Most Typical Avant-Garde: History and Geography of Minor Cinemas in Los Angeles, University of California Press, Berkeley, 2005; Jan-Christopher Horak, First Lovers of Cinema: The First American Film Avant-Garde, 1919-1945, University of Wisconsin Press, Madison, 1995; Paul Arthur, A Line of Sight: American Avant-Garde Film Since 1965, University of Minnesota Press, Minneapolis, 2005; and Michael Zryd, “The Academy and the Avant-Garde: A Relationship of Dependence and Resistance”, Cinema Journal, vol. 45, no. 2, Winter, 2006, pp. 17-42. Sally Banes, Greenwich Village 1963: Avant-Garde Performance and the Effervescent Body, Duke University Press, Durham, 1993. However, as Brenez realizes, Straub’s amusing turn of phrase has to be understood in light of his own ardent devotion to the films of a classical Hollywood director like John Ford as well as his opposition to contemporary commercial and industrial filmmaking. Brenez’s valuable study of the relation between cinema and the category of the avant-garde distinguishes itself by exploring avant-garde practices and forms in the plural, mapping and developing links in new ways among the multiple meanings and histories of these cinema formations. For an English-language translation of the roundtable discussion from which this remark is drawn, see “There’s Nothing More International Than a Pack of Pimps: A Conversation Between Pierre Clémenti, Miklos Janscó, Glauber Rocha, and Jean-Marie Straub convened by Simon Hartog in Rome, February 1970,” trans. John Mathews, Rouge 3 (2004), http://www.rouge.com.au/3/international.html. Paul Fileri is a PhD candidate in Cinema Studies at New York University and a regular contributor to Film Comment. His research interests include the history of French cinema, the relationship between experimental and documentary film/video theory and practice, and the history of film studies and particular cultures of cinephilia.